The ability of the left-wing propaganda machine to demean any action by the Trump administration is on full display following the decision by Vice President Mike Pence to leave an NFL game because players knelt during the National Anthem. Pence and his wife Karen attended the Indianapolis Colts Sunday game that was going to honor former quarterback Payton Manning by retiring his football jersey. 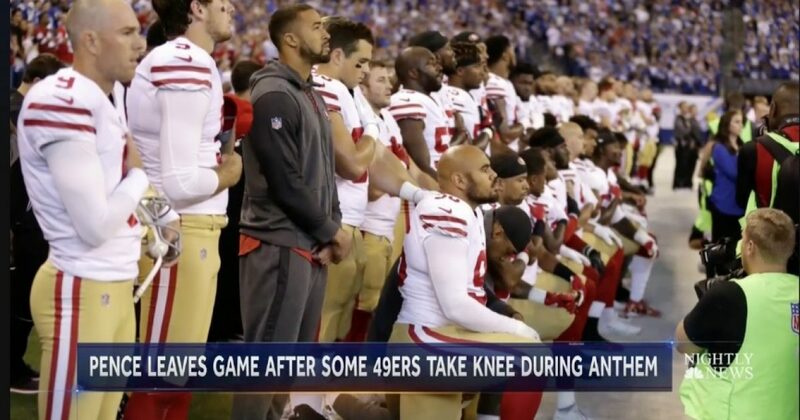 A group of the opposing players from the San Francisco 49ers knelt during the National Anthem and the vice president and his wife left the game. After all the scandals involving unnecessarily expensive travel by cabinet secretaries, how much taxpayer money was wasted on this stunt? ‘So this looks like a PR stunt to me,’ he said in a post-game interview. ‘He knew our team has the most players protest[ing]. He knew that we were probably going to do it again. This is what systematic oppression looks like. The truth is a problem for the left-wing analysis. Pence had scheduled to attend the football game in advance so it was not penciled in to prove a point.